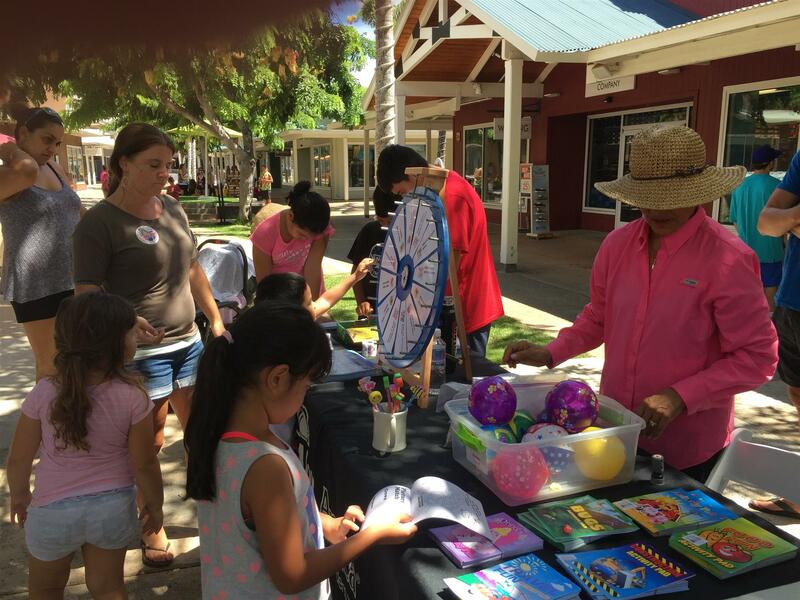 Thanks to our members and Friends of Rotary who manned the Back to School Expo Table at the Lahaina Outlets on Friday August 18th. The Interactive Literacy Game table had many visits by the kids. Sponsored by Read Aloud America, the table featured the entry task of coloring a book mark. Once completed kids had the opportunity to Spin the Wheel. Prizes on the wheel were a pencil with eraser topper, a mini beach ball, an activity booklet or getting to select a brand new book. Because there were not swarms of kids at this first-time event, EVERY student was invited to take home a brand new book. This is the first time the Expo has been held and plans are under way to expand this event for next year. These members and friends worked the drive: Olinda Kelley, Andrew Stamd, Tambara Garrick and one more Bubba Gump’s employee, Nancy Montoya, Josie and Bert Valdez and Allen Inda. All who worked this event supported this year’s theme: Rotary – Making a Difference!